South Berwick Sponge Cake. No. 9. L. Plummer. Beat 6 eggs two minutes; add 3 cups of sugar and beat 5 minutes; add 2 cups of flour with 2 teaspoonfuls cream tarter and beat until mixed; add 1 cup of water with 1 teaspoonful soda & the same of salt, 2 cups of flour and essence; beat until mixed and bake quickly. Cup Cake. No. 6 Nellie Nuttman 2 eggs. 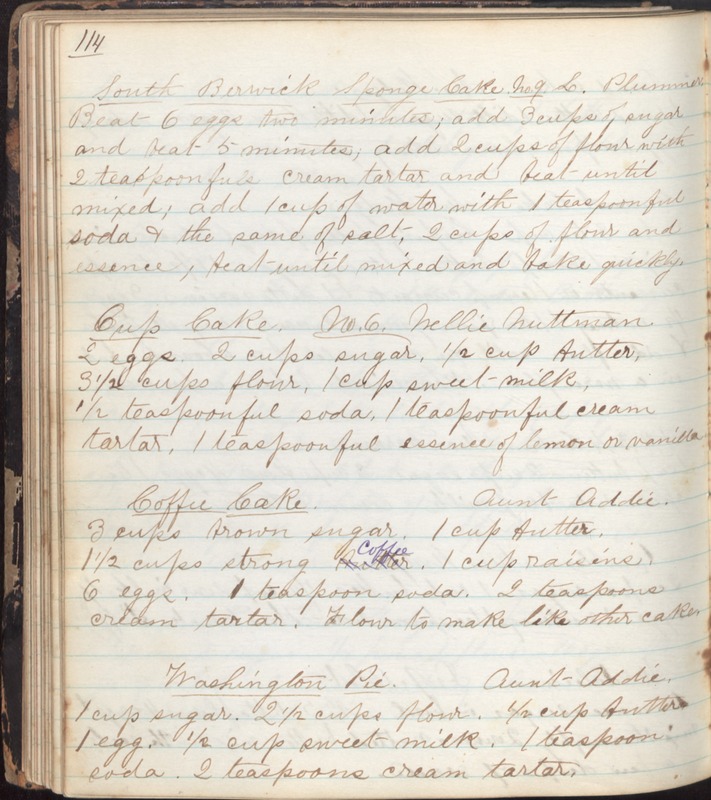 2 cups sugar, 1/2 cup butter, 3 1/2 cupws flour, 1 cup sweet milk, 1/2 teaspoonful soda, 1 teaspoonful cream tartar, 1 teaspoonful essence of lemon or vanilla Coffee Cake. Aunt Addie. 3 cups brown sugar. 1 cup butter. 1 1/2 cup strong coffee. 1 cup raisins. 6 eggs. 1 teaspoon soda. 2 teaspoons cream tartar. Flour to make like other cakes. Washington Pie. Aunt Addie. 1 cup sugar. 2 1/2 cups flour. 1/2 cup butter. 1 egg. 1/2 cup sweet milk. 1 teaspoon soda. 2 teaspoons cream tartar.